The AHMS can perform, record & manage all activities in your hospital! Choose the AHMS with confidence, since we have a 100% satisfaction guarantee up to the first five (5) years of use - the longest guarantee for a veterinary system! The AHMS and our expertise is exclusively focused on veterinary practices, and we know how to best implement technology in your veterinary practice. The AHMS can manage multiple sites and business units using the same data set. A client arrives at one of your clinics, and needs to see a specialist. After documenting needs and produce estimates, check the schedule for the specialist at the main hospital, and transfer that patient to the hospital's Departures for immediate access. We assist with all aspects of welcoming your hospital into the digital world: hardware, software, wired vs. wireless networks as well as all open technologies including Bar Codes (scanners /printing), Tablet PCs, Pet Portals/Vet street®, Home Again®, “The 5 Minute Veterinary Consult”, etc. Our Enhanced Appointment Scheduler is used in one of the largest veterinary practices in the world, and has unlimited capability to manage appointments, doctor rotations, and many other functions! Our Boarding Module handles all boarding and grooming funtions for boarding faciilities of any size, from a couple of runs, to 100s of runs/Cat Condos/cages, etc. Our Dental Profile demonstrates that any paper or static template can be incorporated into the AHMS, allowing digital storage of this information! Our Mobile Module provides the full capability of the AHMS on the road, either house calls, ranch calls or farm visits. When returning, all information can synch with the hospital server. QUICKPACS Technologies is a complete cloud-based RIS/PACS and Medical Image Archival and Storage Solution that gives you an easy and secure method to upload, store, view, share and manage your Digital X-Ray images in the “cloud". 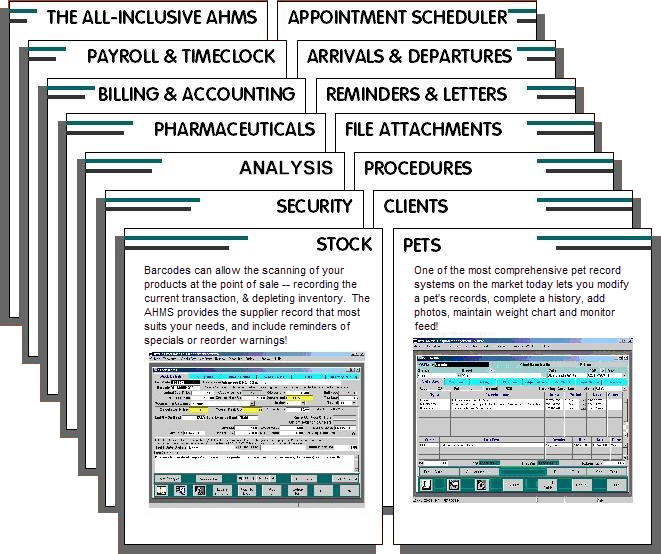 Your digital radiographs are just a click away in the AHMS when stored in QUICKPACS. Plus, you can easily share these images with the client or a referring veterinarian. .
We have developed a multimedia presentation of the AHMS, to impress upon you the ease of use and how well it matches the flow of a veterinary practice. If you are interested in receiving this presentation on CD-ROM, please click here to request a CD and Information Packet! To learn how the AHMS looks and flows, click on Our Web Demonstration and see it in action. If you want to talk with our staff and see specific functions and flows, click here to request a live demonstration. Personalized to your Practice— The AHMS is fully adaptive to your needs. Your clients will appreciate the unique look of your invoices and communications, providing a consistent image with your practice style. Integration	of Multiple Practices and Locations-You can efficiently manage multiple practices and locations, using one data set, and maintain unique information at each location. With our technology expertise and the AHMS, a client can visit one of your practices, then be referred to your specialty referral practice, then transferred to your full-service hospital, and their information is available and updated at each location. This integration extends to all levels: appointments, invoicing, clinical records, etc.